Who doesn't want to take a bite of these? Okay, maybe those of you who are afraid of carbs. In my opinion, carbs in bits and pieces are okay, especially when they are homemade and not store bought. So delight in eating one of these. Every once in awhile, I'll pick up some delicious garlic bread sticks from the Hy-Vee bakery if I know we are having a pasta dinner. Lately, I've thought, I can surely make a replica of those, it can't be too hard. So after browsing some internet sites I found one that caught my eye. We had these last night with fresh green beans and my last (boo) million dollar spaghetti from the freezer. Do you double dishes and freeze one? Genius, in my opinion. In a large bowl combine 1/2 of the flour, half of the melted butter, yeast mixture, sugar, salt, parsley and water - mix. Add remaining flour and mix well. Remove dough to floured surface and knead for 10 minutes or until elastic (this took me about 8 minutes). Return to the bowl and let rest for 10-15 minutes. Return dough to floured surface and roll into a long loaf about 1 inch thick. Using a pizza cutter, slice into strips of equal size. Take strip and twist, then lay on greased baking sheet. Using a brush, spread on remaining butter and sprinkle with garlic powder. Cover with towel, place in warm area and let rise for 45 minutes to an hour. Bake at 350 degrees for 18-20 minutes, until just golden brown, do not over bake, you want these to be soft. Eat immediately, or store in an airtight container and they will keep for 3-5 days, simply reheat before eating. This may sound like a long, tedious recipe, but trust me it's not! Much easier than you think, and so very worth the rewards! Guess what tomorrow is? GIVEAWAY time! The lovely folks over at CSN Stores contacted me about hosting a giveaway for a $40 gift card to any of their online sites. This can go towards anything. What do you need? A new mixer? Some new baking sheets? Heck, a new dining room centerpiece? You name it, they have it. And on a final note - did anyone watch The Little Couple last night on TLC? Well, Bill (the husband) was at my former place of work speaking at their annual conference. Did you see it? I really miss that place! 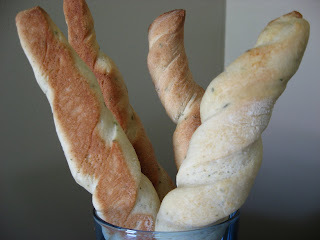 Those garlic bread sticks look fabulous!! I love dipping them in marinara sauce... mmmmmmmm!! I will eat one please! With some nice marinara I would love this. Yummy! I love bread sticks! Oooooh I am excited for the giveaway!!!! Those breadsticks are very impressive!! My husband and I love the Little Couple Show! Actually, when I saw it was in Iowa, I wondered if it would be close to where you live! Have you written a book yet? All of your dishes look so great and professional! Biz - thanks for thinking of me watching the show! Many of my good friends were there with Bill and said great things about him! Lori - are you reading my mind? I've been working on a cookbook proposal for awhile now, just have to find an agent who will take it! ow- Can I have the big fat bread stick? Those are my fav ;) Looks amazing. Afraid of carbs? I'm not sure I understand this concept hehe. It is Rachael Ray cookware! I love it- I want more!! I really really really want to eat those! ok seriously I could eat those right now! Those look so yummy! Thanks for linking in to Simple Lives Thursday. Mmm. Going to give these a try. Most of my readers are Facebook friends or follow me on Twitter so I assumed everybody was caught up w/ me! :) I'm in NC at my parents' and working at an ice cream shop for the summer. We've also been picking blueberries and figs to sell to the local farm stands for extra $ too! These look delicious! I will be trying them out. Thanks for the recipe. 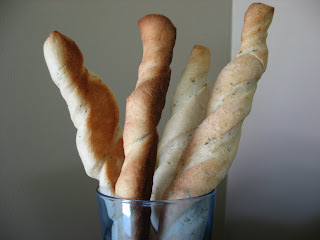 Your bread sticks look yummy - home made is always so much nicer than store bought!! I don't worry about carbs but hey I have a bog fat a** so maybe I should? heehee! 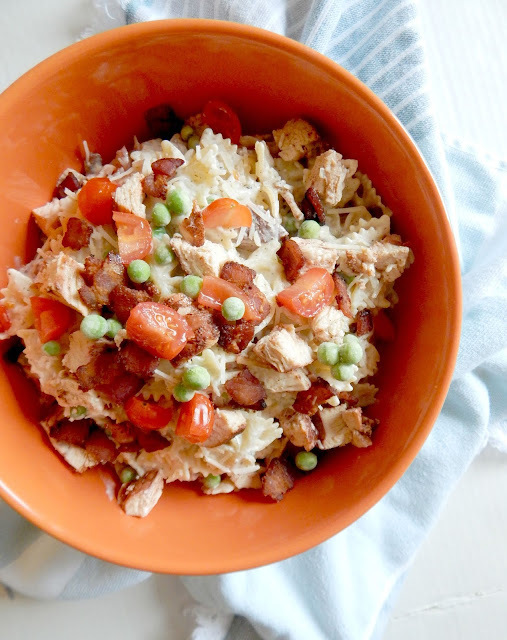 Thanks for linking up to Just Another Meatless Monday! CSN Stores Gift Card GIVEAWAY!